Unfortunately, after nearly every ice event in the Charlotte Metro area I receive numerous calls from people with light to heavy damage on their concrete surfaces due to recommendations of peers and even other contractors that rock salt (aka concrete cancer) is the best de-icing agent. Their driveways are chipping up, and they want to know how to stop it, or the cheapest way to fix it. Unfortunately, I think that most of the time I do not give them the answer that they were hoping for. Any chemical that starts to chip off the surface of concrete is cancerous, and the only cure is amputation!! In other words; the driveway must be demolished, and re-poured. Now, please don’t get me wrong. Many contractors will tell you that there is a “new product” that is used that can be layered on top of the damaged areas. Maybe there is…I have been hearing about this mysterious product for years, but have yet to hear any positive feedback about it. 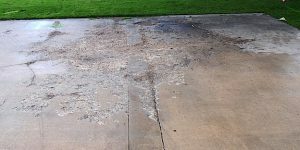 From what I understand, it requires the existing concrete to be grinded, pressure washed, pre-treated, and then overlayed with a top coat of this “concrete-in-a-bag”. I am very skeptical of this process. To me it seems like the salt or chemicals from the salt would be spread around during these processes, thus spreading the “cancer”. You can’t just put new skin on top of cancer. You have to completely remove it or it will spread. If anyone has had success with any of these miracle products, PLEASE let me know. I am so sorry if you have already had damage to your driveway due to rock salt, or any other de-icing chemical. Even though it adds to my business, it genuinely saddens me to have to break this news to home owners. I enjoy adding and enhancing a home owner’s concrete much more than replacing a “used to be perfect” slab. If you are considering rock salt, STOP!!!!! I don’t care what the Lowes clerk, general contractor, your uncle Eddy, or even the manufacturer has told you. It is NOT WORTH THE RISK!! If you already have a damaged concrete surface, call us or request a quote today. It probably isn’t as expensive as you thought to remove and replace.